Editor’s Note Born in New York City, Ian has lived the majority of his life in Asia, and has transformed his love of mountain climbing, philosophy, art, and exploratory travel into a fascinating career. In 2001, he was honoured by National Geographic Society as one of seven “Explorers for the Millennium” for his research and discoveries in southeastern Tibet. Ian is the author of seven critically-acclaimed books on Himalayan culture, traditional medicine, Buddhism, and yoga. His literary chronicle of a series of ground-breaking expeditions into the world’s deepest gorge The Heart of the World: A Journey to Tibet’s Lost Paradise was published by Penguin Press. His latest work, Tibetan Yoga: Secrets from the Source will be launched in fall 2016. Click Here to view 'Tibet’s Secret Temple' Gallery in Sutra Journal. Vikram Zutshi: How did you find your way to Tibetan Buddhism? When and why did you decide to make a career out of it? What is your specialty within this field? Ian Baker: My introduction to Tibetan Buddhism occurred in 1977, when I went to Nepal to learn traditional Tibetan scroll painting. I became increasingly intrigued by the complex symbolism of Tibetan art and the philosophical richness that underlies its aesthetic forms. While in Kathmandu, I also met a great Tibetan Buddhist master, Chatral Sangye Dorje Rinpoche (who passed away on December 31, 2015 at the age of 102). Because of my interest in Tantric Buddhist practices and artistic traditions, I returned to Nepal in 1984 as Academic Director of a US-based college semester abroad program. I ran the program until 1990, spending most of my summers in Tibet or in remote regions of the Himalayas, at the instigation of Chatral Rinpoche. My interest in Tibetan studies centred on its non-monastic yogic traditions and, in particular, on the ways in which landscape and environment can support a transformed experience of the human condition. 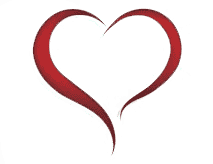 Vikram Zutshi: Tell us about your book The Heart of the World. What are the biggest lessons you took away from the journey? 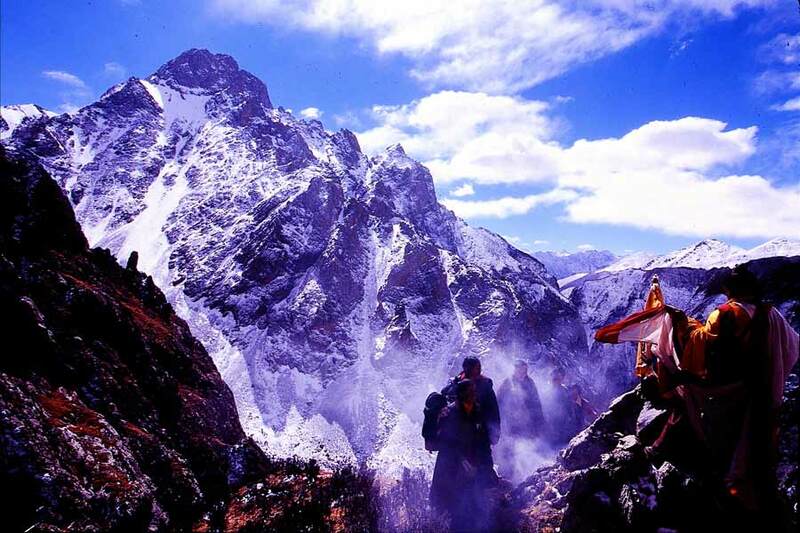 Are there any other mythical places left to discover in the Himalayas that you're aware of? Ian Baker: The Heart of the World is a book that chronicles my exploration of the Tibetan tradition of beyul, or ‘hidden lands’. Beyul are places where the physical and spiritual worlds are said to intersect and where meditative and yogic practices are said to be especially effective. Located in remote regions of the Himalayan mountain range, beyul are also places known for their extraordinary bio-diversity and physical beauty. The biggest lesson that I learned from staying for extended periods in several such hidden-lands is that wild and untamed landscapes can open us to dimensions of experience that are often overlooked in more tempered environments. There are many such beyul, hidden throughout the Himalayas as well as in other parts of the Earth. According to Tibetan tradition, the greatest of these hidden-lands is Beyul Pemako, at the eastern edge of the Himalayan range. Like all beyul it is described as having outer, inner, secret, and ‘innermost secret’ dimensions. I will be returning to Pemako later this year to follow a route that’s said to lead into its innermost recesses. The Tibetan texts liken Pemako’s innermost reaches to the womb of the Tantric goddess, Vajra Varahi, whose terrestrial body forms Pemako as a whole. Vikram Zutshi: What are the main tenets of Tibetan Buddhism and how is it distinguished from the Buddhism practiced in Thailand and Sri Lanka? Ian Baker: Tibetan Buddhism derives from the Vajrayana, or Tantric form of Buddhism that originated in India and developed, in textual form, from the eighth century onward. Unlike the earlier forms of Buddhism that are practiced in southeast Asia, Tibetan Buddhism advocates a less renunciatory approach to human existence that’s based on engaged compassion and dynamic interaction with the sensory world. Vikram Zutshi: What are the different schools of Buddhism within Tibet? What are their defining characteristics? Ian Baker: The many streams of Tantric Buddhism that entered Tibet from the eighth century onward are currently classified into four major schools: the Nyingma, the Kagyu, the Sakya, and the Gelug. To generalise, the earlier transmissions of Vajrayana Buddhism to Tibet emphasised non-monastic yogic practices that became less prominent in the later reformed Gelug tradition that places more importance on scholastic study and monastic ritual. 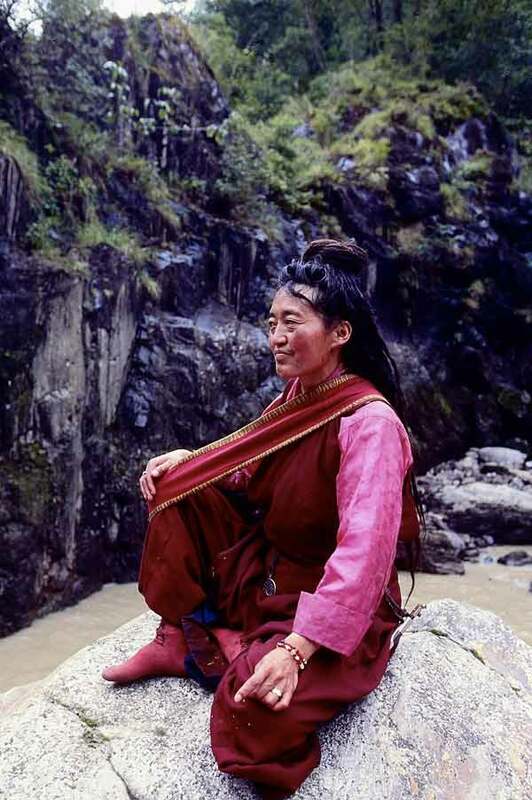 Tibet’s indigenous pre-Buddhist tradition of Bon has also deeply influenced Tibetan Buddhist practice, especially at the level of the general populace. At the same time, Bon has incorporated much from Buddhism and has its own independent transmission of Dzogchen, the ‘Great Perfection’ teachings that represent the culmination of the spiritual path and ultimately transcend their cultural origins. Vikram Zutshi: What are the origins of the Kalachakra initiation? What are the differences and similarities between Tantric Buddhism and Indian Saiva soteriology? 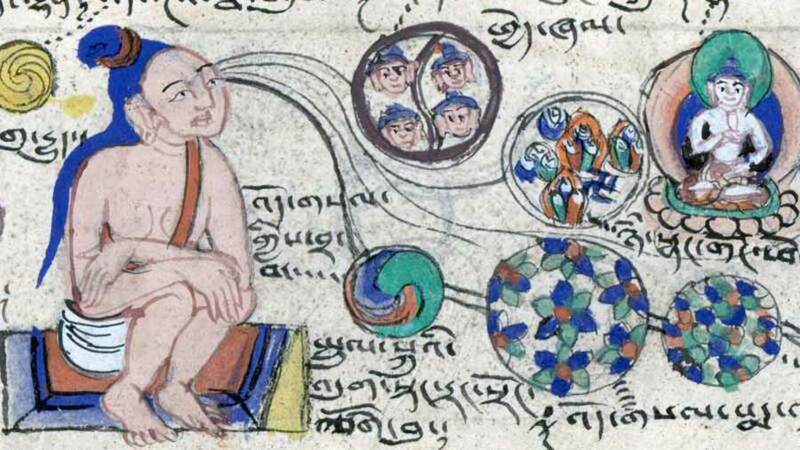 Ian Baker: The Kalachakra Tantra was the last great literary production of Vajrayana Buddhism in India, appearing at the end the 10th century and attributing its origins to teachings given by the Buddha to a king who asked for a path to enlightenment encompassing of his worldly responsibilities and proclivities. As the ‘Wheel of Time’, the Kalachakra is vast in scope and emerges out of an ancient Indian myth that is reformulated in the context of the Kalachakra Tantra as the Kingdom of Shambhala, an enlightened realm into which those who receive the Kalachakra Tantra initiation from an authentic source will ultimately be reborn. All of the Buddhist Tantras, and the later so-called Yogini Tantras in particular, draw actively from concurrent traditions of Tantric Saivism, thus extending the reach of Buddhist ideals beyond their conventional monastic settings and embracing more dynamic forms of contemplative practice. Vikram Zutshi: Tell us about your studies in the Tibetan healing arts and the book that came out of it. What are the some of the commonalities and differences in Tibetan medicine, Ayurveda and traditional Chinese medicine? Ian Baker: I studied traditional Tibetan Medicine in the 1980s, while living in Kathmandu. My particular interest was in what is called in Tibetan Chod-Men, or the synthesis of Buddhism and the healing arts. The inner practices of Tantric Buddhism are deeply embodied and involve increased attention to physiological processes. The practices of the Inner Tantras are also actively enhanced through the use of supporting medicinal formulas. I wrote about this in my book The Tibetan Art of Healing as well as in The Heart of the World. Tibetan Medicine is very rich in that it integrates traditional Indian and Chinese practices and pharmacological knowledge into its diagnostic and curative methods. It is further enhanced by its active incorporation of Tantric practice and insight into psycho-physiological processes within the human body. Vikram Zutshi: What are the defining characteristics and central themes of Tibetan art? What are the significant periods for the flourishing of art and the main schools that emerged? Ian Baker: Tibetan Buddhist art can be seen as an attempt to represent knowledge of the unseen world in aesthetic and visual form. For what was once a largely illiterate populace, symbolic depictions of Tantric Buddhist deities became a means for conveying the essential meaning of the Buddhist path of wisdom and compassion. Deities in Tibetan Buddhism are ultimately understood as reflections of our inner, and mostly unrealised, qualities and attributes. They are thus shown in peaceful, passionate, and fierce manifestations to bring awareness to the need for transforming emotional afflictions of greed, anger, and unmerited fear. Bronze casting as well as scroll and mural painting in Tibet were influenced by Newar art of the Kathmandu Valley, by Pala Dynasty India, as well as by artistic traditions in Kashmir. Later traditions of Tibetan Buddhist art, particularly representations of the natural environment, were strongly influenced by Chinese landscape art. Vikram Zutshi: Tell us about your latest book on the Dalai Lama's Secret temple. How do the findings in the temple affect yogic practitioners today? Please describe the style and central themes of the artwork found within. Ian Baker: One of the strongest examples of Tibet’s syncretistic artistic tradition can be seen in the Lukhang, a residential temple built for the Sixth Dalai Lama at the end of the 17th century. The murals in the Lukhang’s uppermost chamber comprise a visual encyclopaedia of the path to enlightenment and were originally intended as a meditational support for Tibet’s supreme spiritual rulers. The current Fourteenth Dalai Lama specifically requested me to write a book about the murals as he felt that the teachings that the murals reveal might otherwise be lost. He described the murals as ‘jewels’ of Tibetan civilisation. My book, The Dalai Lama’s Secret Temple, elucidates the content of the murals which are based on Dzogchen, or ‘Great Perfection’, teachings revealed by a 15th century Bhutanese master named Pema Lingpa, who was an ancestor of the Sixth Dalai Lama. There are three principal murals in the room that was once a private meditation chamber for the Dalai Lamas. One mural depicts Tantric Buddhist masters known as Mahasiddhas. Another mural shows yogic practices for opening subtle energy channels within the physical body. The third mural illustrates visionary meditation practices for ultimately attaining a rainbow light body. All three of the murals show ways in which yogic practice harnesses physiological, respiratory, and hormonal processes to transform the human condition. As the Dalai Lama hoped, the contents of the murals are now reaching a wider audience both through the book, to which he contributed an introduction, as well as by the current ‘Tibet’s Secret Temple’ exhibition at London’s Wellcome Collection. Vikram Zutshi: How are Tibetan forms of physical yoga different from Indian Hatha Yoga? What are the differences and similarities in their internal energetic maps and psychophysical hierarchy? Ian Baker: Tibetan yoga is called Trulkhor, which can be translated as the ‘wheel that purifies illusion’. The core movements are performed with the breath held below the abdomen while drawing internal energy into the body’s central axis to stimulate hormonal secretions and free the mind from habitual patterning. The sequences are more akin to dynamic forms of Chinese Chi Gong than they are to Indian Hatha Yoga, but they share the same ultimate objective of transforming human experience. One significant difference between Trulkhor and Modern Postural Yoga is that Trulkhor is undertaken specifically as a preparation for advanced forms of bioenergetic meditation, whereas for most yoga classes today comparable exercises are performed primarily for physical health and wellbeing. Vikram Zutshi: You are curating an ongoing exhibit at the Wellcome collection in London called ‘Tibet's Secret Temple’. Please describe the central theme and some of the important displays in the exhibit. Why are these carefully guarded secrets being made public? Ian Baker: ‘Tibet’s Secret Temple’ is an exhibition at London’s Wellcome Collection that will continue until February 28, 2016. The exhibition’s central feature is a life-size recreation of the Lukhang murals that can be viewed close up in incredible detail. Although these murals, and the yogic methodologies that they reveal, were once deeply guarded secrets, the current Dalai Lama has actively endorsed the exhibition and hopes that the murals will provide important keys to humanity’s ultimate potential. In the context of the exhibition, the murals are approached through a series of interconnected rooms that place the contents of the murals in historical and cultural context and focus on related topics such as Tibetan Medicine and Tantra. There are also several video installations that contextualise and expand on what can be seen in the murals. Some of the associated art in the exhibition is drawn from the Wellcome Collection’s archives and some of it is on loan from museums and private collections. Some of the most engaging objects were commissioned in the Himalayan Kingdom of Bhutan and provided with the support of Bhutan’s Royal Family. Vikram Zutshi: The Wellcome site says that "the final room of the exhibition explores scientific investigations into these once secret practices of Tantric Buddhism and their impact on psychological and physiological health and understandings of human consciousness". Can you elaborate on the scientific research being conducted in this area and what are the major findings? Ian Baker: The final room of the ‘Tibet’s Secret Temple’ exhibition centres on a 15-minute video presentation that includes the perspectives of a Tibetan lama, a scientist engaged in the study of the neurological correlates of consciousness and compassion, and educators involved with the application of mindfulness training in educational and clinical settings. The topics that they discuss in the video will be enlarged upon in forthcoming events at Wellcome Collection, in particular a Mindfulness Symposium that will take place on February 20. The Dalai Lama initiated the dialogue between science and Tibetan Buddhism in the 1980s and technological advances today reveal ever more supporting evidence for the ways in which the autonomic nervous system can be positively effected by yogic interventions. Much of the research has focused on clinical applications of Mindfulness training in the treatment of anxiety and depression, but more recent work is also addressing the ways in which Open Presence meditation – akin to Dzogchen – effects the brain in entirely different ways, localising activity in the Hypothalamus. Other contemporary research is showing the ways in which breath retention techniques analogous to Tummo, or the Tibetan yoga of ‘Inner Heat’, stimulate the production of mood enhancing neurotransmitters such as Dopamine as well as positively influence the human immune system. 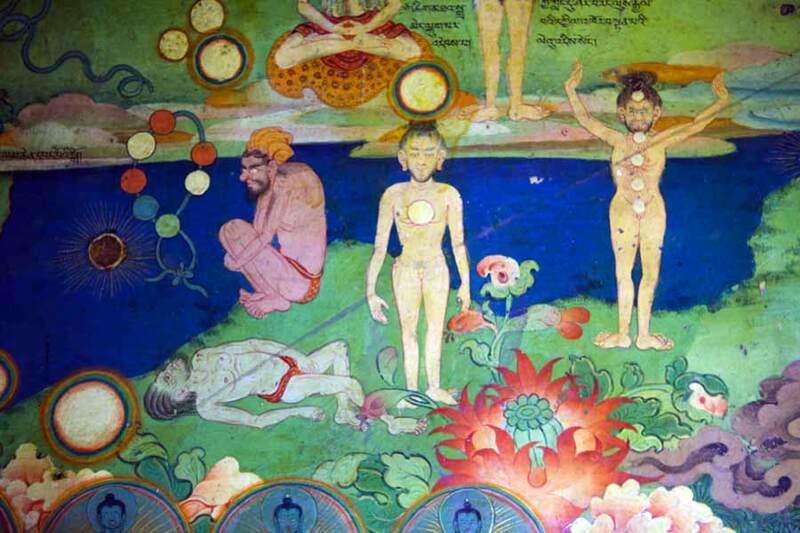 Perhaps the most revealing aspect of current research is the articulation of hormesis, a neurobiological phenomenon whereby a beneficial effect (stress resilience, improved health, growth or longevity) can result from potentially dangerous activities such as yogic breath suspension and alteration of the blood supply to the brain, as illustrated in the Lukhang murals. As the Dalai Lama has said, altering physiological processes in deliberate and systematic ways can increase strength and resilience, but can also lead to sudden death! It’s for such reasons that the yogic practices depicted in the Lukhang murals were only to be undertaken with the guidance of an experienced teacher. Nonetheless, they can open our eyes and imagination to unimagined possibilities of the human condition. I will be writing more about this in a forthcoming book entitled Tibetan Yoga: Secrets from the Source. Click Here to view a photo gallery of images by Ian Baker in Sutra Journal. Vikram Zutshi is a writer-producer-director based in Los Angeles. After several years in indie film and network TV production, then a stint as Creative Executive at 20th Century Fox and later as VP, International Sales/Acquisitions at Rogue Entertainment, he went solo and produced two feature films before transitioning into Directing. His debut feature was filmed at various points along the two thousand mile US-Mexico border and has since been globally broadcast. He is a passionate Yogi and writes frequently on Buddhism, Shaivism, Sacred Art, Culture and Cinema. As a photojournalist, Vikram often travels on expeditions to SE Asia and Latin America and is involved with a number of charities that empower and educate street children in India, Brazil, Mexico, Vietnam and Indonesia. He is currently prepping Urban Sutra - a TV series about the transformative effects of Yoga in strife-torn communities and Darshana: The Aesthetic Experience in Indian Art, a feature documentary on Hindu, Jain and Buddhist Art. Ian Baker is an anthropologist and independent scholar who works internationally as a consultant and lecturer in environmental and cultural heritage conservation. Ian studied art history, literature, and comparative religion at Middlebury College, Oxford University, and Columbia University and Medical Anthropology at University College London. He also pursued personal and academic studies of Tantric Buddhism in India, Nepal, Bhutan, and Tibet, beginning in 1977. He is the author of seven books on Himalayan and Tibetan culture including Tibet: Reflections from the Wheel of Life,The Tibetan Art of Healing,The Dalai Lama's Secret Temple: Tantric Wall Paintings from Tibet, andBuddhas of the Celestial Gallery. He has also contributed to both popular and academic journals and publications including National Geographic Magazine, Asian Medicine: Tradition and Modernity (J.P. Brill), and the University of Vienna Press. Profiled by National Geographic Society as one of seven “Explorers for the Millennium", Ian’s 2003 book, The Heart of the World: A Journey to the Last Secret Place chronicles his numerous research expeditions into remote regions of the Himalayas and his documentation of a waterfall in the world's deepest gorge that had been the source of myth and speculation among geographers since the 19th century. Ian served as co-curator for the Wellcome Collection’s 2015-16 exhibition ‘Tibet’s Secret Temple: Body, Mind, and Meditation in Tantric Buddhism’, a project that originated with Ian’s book entitled The Dalai Lama's Secret Temple: Tantric Wall Paintings from Tibet and for which His Holiness The Dalai Lama provided extensive commentary. He is currently completing a book entitled Tibetan Yoga: Secrets from the Source that will be published later this year.